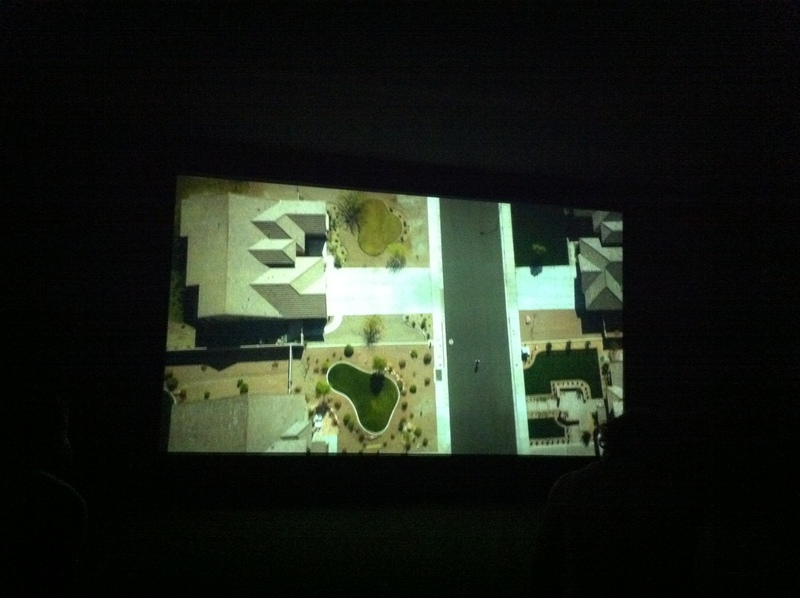 It is Autumn 2013 and Omer Fast’s ‘5,000 Feet is Best’ is showing at the Imperial War Museum in London. ‘5,000 Feet is Best’ recounts what it is like to be a drone pilot. Fast wants us to think he has used interviews with pilots. In some cases the interviews seem staged, like the one in the dark hotel room, who tells his interviewer as he shifts in his seat in front of the camera, answering the question ‘what would you like to talk about?’ with ‘you’re paying’ implying that he will answer specific questions. But at another point the same drone pilot, who seems to suffer from PTSD also says to his interviewer; ‘you’re not a real journalist’, leaving us wondering what is going on- is this an interview or not? We, the viewers become disorientated in other places in the film, when narratives shift and the plot thickens as the drone pilot interviewed in the hotel room, becomes a masterful story teller, throwing us between a hotel room in Las Vegas preparing for a scam to a train drivers sob story of obsession and intimidation, to the suburban family’s holiday gone wrong (which can be viewed here). But all the stories are about the power and horror of visual perceptions and the drone pilot’s perspective keeps re-surfacing and coming to the fore- even when we think we are watching something else entirely. There are also ‘talking heads’ type interviews with the ubiquitous blurred out faces of the pilot speaking to the camera. Its as if Fast is saying: if you don’t believe the dramatized version…here is the ‘documentary’. The fact that the ‘documentary’ is all blurred is yet another way for Fast to play with us, his audience. Some of the speakers pass on technical information- much of it about modes and capabilities of vision. Others recount the hardships of daily life behind the console or work station, such as the need to ‘separate work life and home’ or ‘its not like playing a video game – you cannot switch off’ and ‘you cannot call the stress virtual’. The film is best described as a clever and striking study of film as media, especially in times of war. It is a masterful and kalaidscopic collage of truth and fiction, artistry, horror and beauty. And what I found most striking is the way Fast plays clever games with us the audience; we think we are watching a drone pilot in hotel room and then find ourselves see something horrific and then realise it’s quite ‘beautiful’- which leaves one feeling very uncomfortable to say the least.